Situated along London's South Bank is the luxury Mondrian Hotel, which boasts a chic and sleek eatery on the ground level, Sea Containers. A few weeks ago we were invited along one Sunday to taste their brunch menu and I am not one to turn down the offer of brunch! Needless to say from the name 'Sea Containers', which suggests a fishy menu, I wasn't expecting much in the way of choice for a plant-based eater like myself but I was promised that the staff in the restaurant are on hand to customise any dishes to suit my dietary requirements. 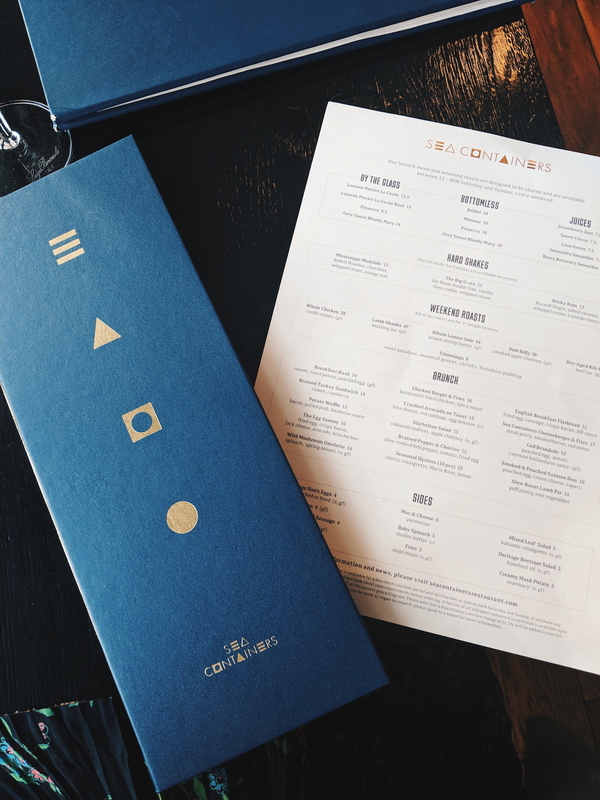 We arrived around 1pm on a Sunday afternoon to a incredibly busy but spacious restaurant; it was obvious immediately that the draw of Sea Containers' bottomless weekend brunch menu is popular! The restaurant bring the best of British and American cuisine to the Thames and strikes the perfrect balance between a casual yet luxury dining experience where you can indulge in a wholesome menu whilst enjoying the views over the River Thames. In the centre of the restaurant sits a huge bar adorned with a suspended submarine in the centre, which touches upon the continued maritime theme that runs throughout the rest of the hotel. When you first glance over the weekend brunch menu, you'll notice that as predicted it is very meat dish dominated with roast dinners, burgers and sea-based dishes. Once we were seated we explained our dietary restrictions to our waiter who ran through the menu and told us what could be adapted to suit our needs. 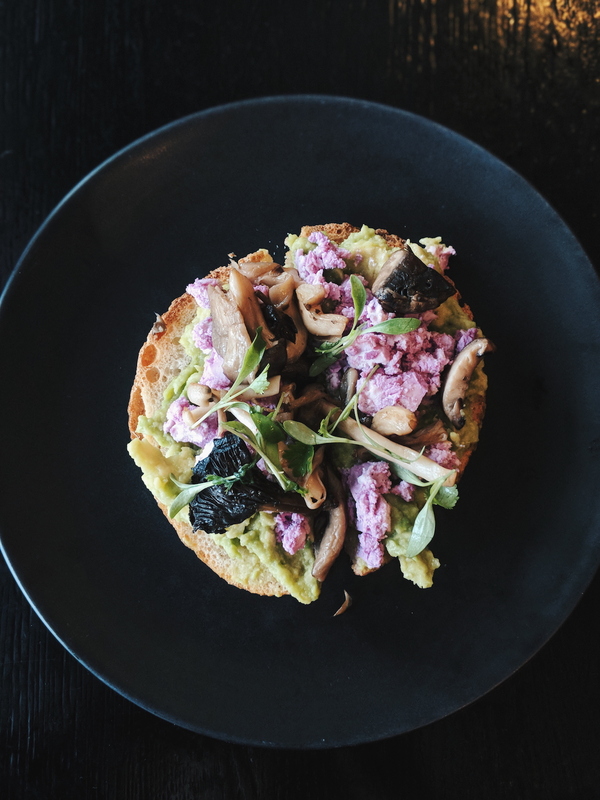 I ended up deciding upon the crushed avocado on toast with crumbled feta, red cabbage and I replaced the egg mousse with a sprinkle of wild mushrooms as I don't eat eggs. You'll notice from the photo that it could quite possibly be the prettiest avo on toast that I've ever eaten as the feta was dashed with the pink from the red cabbage! The toast below the toppings was a soft, chewy sourdough, which proved difficult to cut through but was absolutely worth the effort as it was utterly delicious! 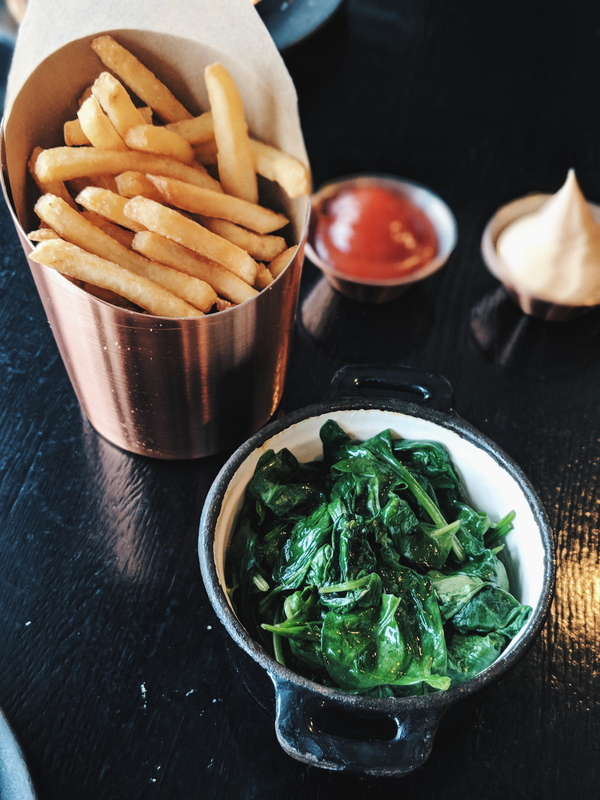 For sides we ordered baby spinach fried with shallot butter and some fries. 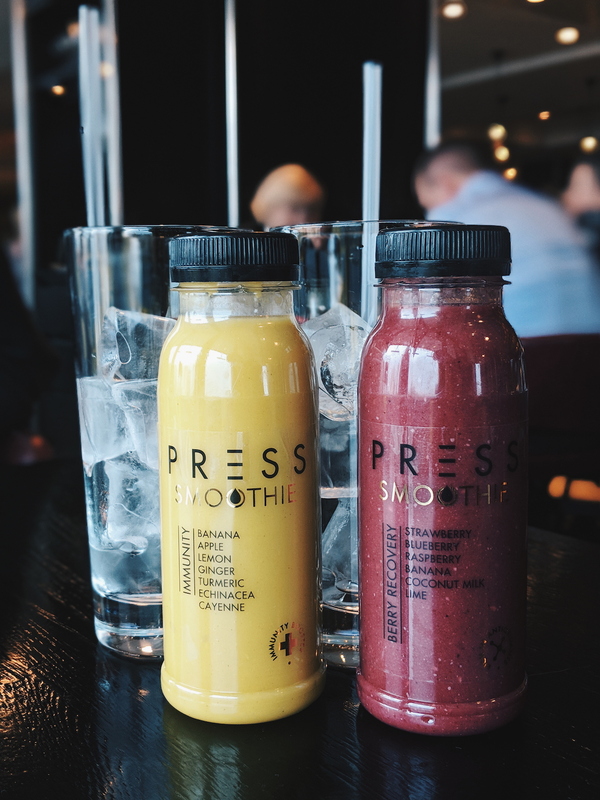 Before delving into the alcoholic menu, we opted for a couple of their fresh press bottled smoothies to nurse our sore heads from the night before because when are we not hungover on a Sunday? 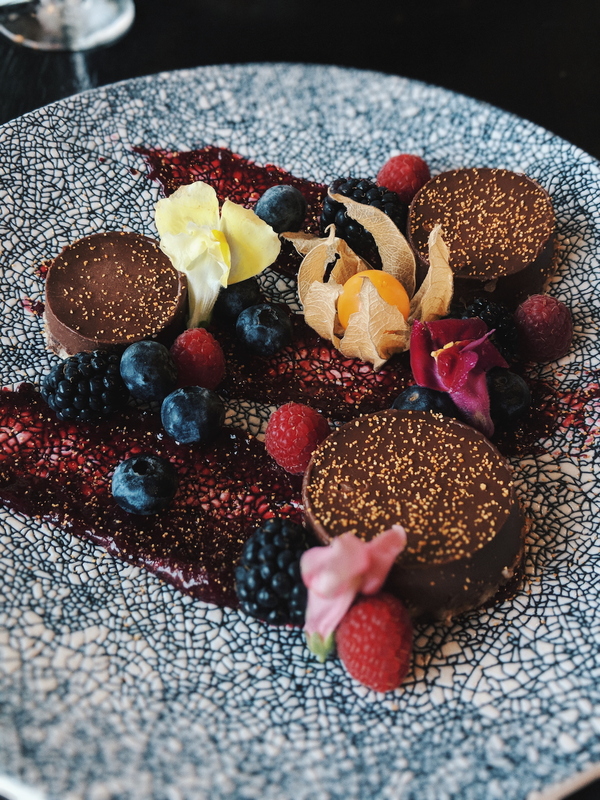 After feasting on our first dishes, we decided to have a nosey at the dessert menu and we suddenly found an extra bit of room in our stomaches after spotting the vegan chocolate cake and fruit salad with yuzu sorbet! The rich, indulgent vegan chocolate cake drizzled with berry coulis and dotted with fresh forest berries was split into three more manageable servings. It was quite possibly the most delicious vegan chocolate dessert that I've ever tasted and I've been dreaming of it ever since! 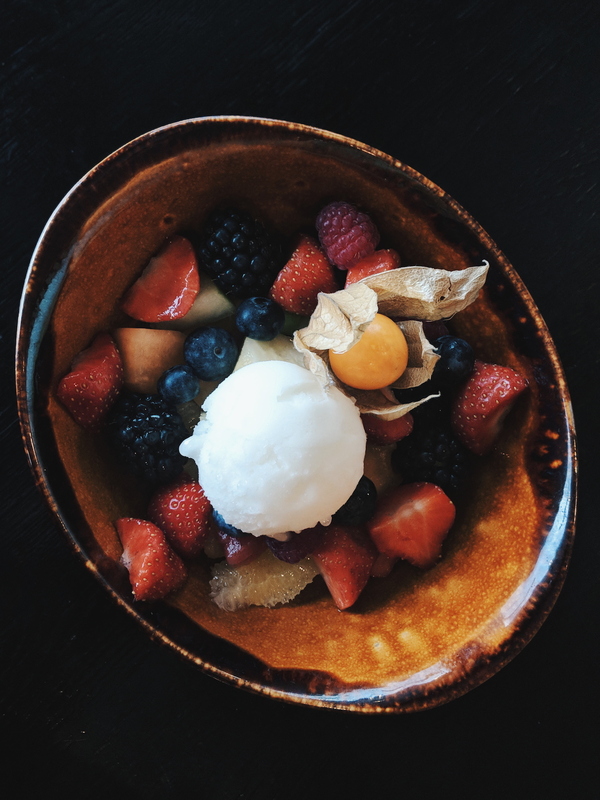 James' flavoursome fruit salad with topped with a scoop of refreshing yuzu sorbet, which cleansed and refreshed the palette perfectly! 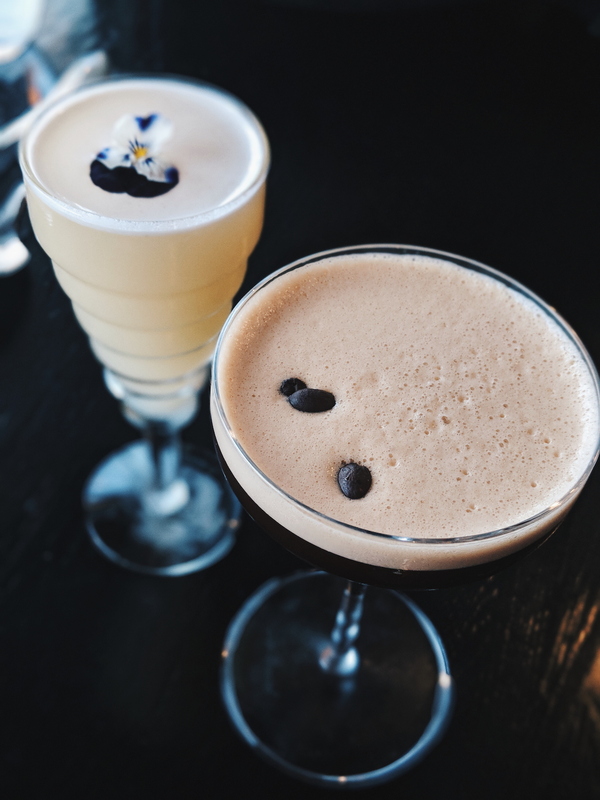 We finished our brunch by toasting the afternoon with an espresso martini (for me) and a Gingerbread Runaway cocktail (vodka, hazelnut, lemon-spiced gingerbread syrup & egg white). Disclaimer: We were offered a complimentary brunch in exchange for an honest review and all opinions are my own. That all sounds amazing. I've walked past this place a few times and always wondered what it was like inside. Love reading your review, the photos showcase the dishes really well. Everything looks so good and healthy and delish! My oh my, this looks absolutely delicious. Adding it to the list!